On this date in 1937 Italian strongman Benito Mus­so­lini paid his first visit to Ger­many, meeting Adolf Hitler in the Fuehrer’s pri­vate resi­dence in Munich. During the visit Musso­lini made Hitler an honorary cor­poral of the Ital­ian Fascist mili­tia, while Hitler con­ferred the Iron Cross of Greater Ger­many on Musso­lini. The meeting of the two former World War I cor­porals in­cluded a secret under­standing regarding Aus­tria, the tiny coun­try (6.75 million people in 1937) that lay between them. Hitler made his guest aware that Italy’s accep­tance of his scheme to gobble up Aus­tria (the so-called An­schluss, or union) was a pre­con­di­tion of their two nations’ friend­ship. For his part, Il Duce (Italian, “the leader”) was ready to accept An­schluss as long as Hitler in­formed him in ad­vance. Hitler kept his word, apprising Mus­so­lini of Ger­many’s up­coming annex­a­tion of Aus­tria in a letter dated March 10, 1938, just two days before Nazi troops surged over the border. Musso­lini floated the idea of a multi­na­tional treaty that would guaran­tee Aus­trian inde­pen­dence, but it was rejected by Schu­schnigg when the two men met in August 1934. One alter­na­tive—Italian troops on Aus­trian soil—made Schu­schnigg ner­vous: “Polit­i­cally un­accept­able,” he told an irked Musso­lini. Schu­schnigg failed to fore­see the steps Hitler would take to bring Aus­tria into the Nazi firma­ment, including arresting and interning him in Sach­sen­hausen, then Dachau con­cen­tration camps after Musso­lini aban­doned Aus­tria to the Nazi pre­da­tor. When columns of goose-stepping jack­boots, can­non, and armored vehicles entered Austria’s capital, Vienna, in March 1938, an aggressive pan-Germany was born. 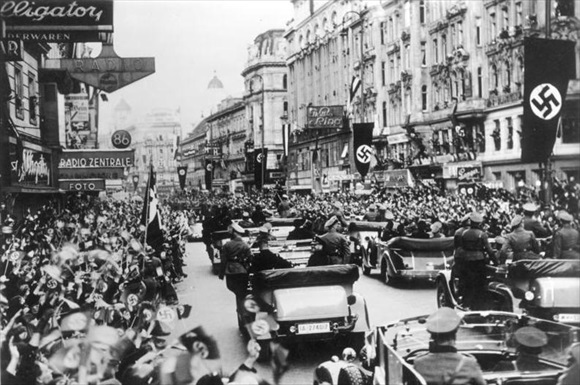 Above: Tens of thousands of Austrians lined Vienna’s streets hours before Hitler’s motor­cade entered the capi­tal on Monday, March 14, 1938. Hitler had followed his army’s en­trance from Bava­ria into Austria on Satur­day, March 12, visiting his birth­place, Braunau am Inn just over the German border, before arriving that evening to an enthu­si­astic wel­come in Linz, Austria’s third-largest city. Hitler’s travels east­ward were turned into a trium­phal tour that cli­maxed with his speech in Austria’s capi­tal on Tuesday, March 15, 1938. “Not as tyrants have we come, but as liberators,” he told his audience. 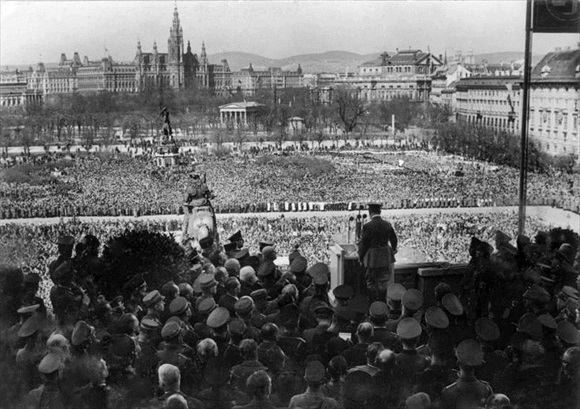 Above: A crowd estimated at 200,000 gathered in Vienna’s Helden­platz (Heroes Square) to hear Hitler say: “The oldest east­ern pro­vince of the Ger­man people shall be, from this point on, the newest bas­tion of the Ger­man Reich.” The An­schluss was given imme­di­ate effect by a legis­la­tive act, sub­ject to voters’ rati­fi­ca­tion. A plebis­cite was held on April 10 and approved by 99.7 per­cent of the voters, but not before 70,000 peo­ple had been arrested, and not before a huge propa­ganda cam­paign had had its effect, and not before some 400,000 peo­ple (nearly 10 per­cent of the eli­gible voting popu­la­tion) had been disen­fran­chised. Those un­able to vote were chiefly for­mer mem­bers of left-wing par­ties and Jews (200,000 in Vienna alone). Aus­tria became the Ger­man province of Ostmark, its once-vibrant capital eventually turned into a drab provincial town.